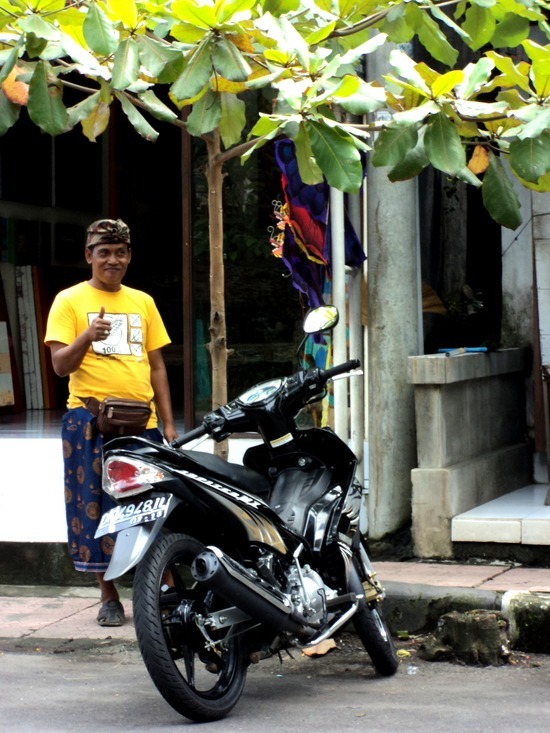 A man named Stephen Kot created a beautiful video that really captures Bali… have a peak. The weather here is phenomenal. Hot. Well, at least warm everyday. When it’s overcast it doesn’t seem quite so intense but I’m quite sure it hasn’t once dropped below 22 degrees Celcius. And it’s humid. But not to the point where it’s unbareable. Or maybe I’m just getting used to it after four days here. If you’re in the sun though or doing anything physical, you’re in a constant state of sweat. Even the Bintang beer bottles perspire relentlessly. The mosquito’s are bad. Repllent definitely required, but I have been totally fine without a mosquito net over my bed. Although tonight I’m in Padangbai and my bed came with some kind of draping fabric. Not sure if it’s to yield off mosquito’s or just for show but either way, it kinda makes me feel like a princess. 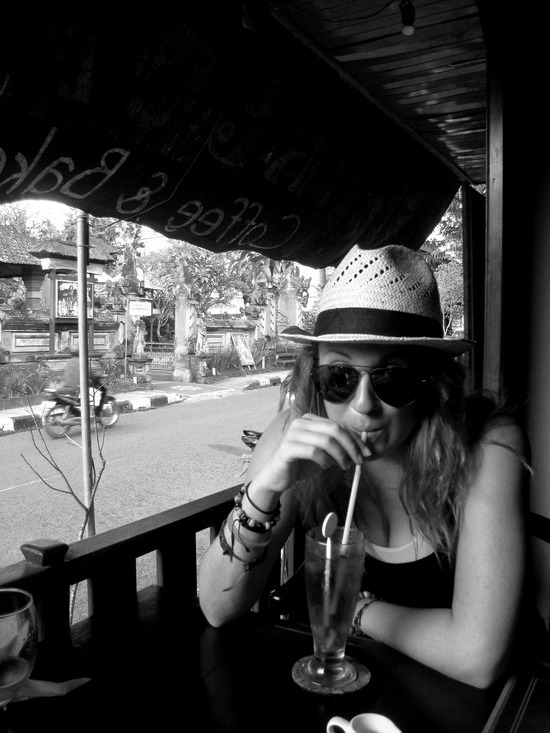 The cheapest thing to eat in Bali is the Indonesian fare. So guess what we’ve been eating? Options really boil down to noodles with veggies (mie goreng), rice with veggies (nasi goreng), or peanut sauce and skewers with rice (. Thankfully, this food is fantastic. And a plate of it is usually only rings you up a $2-3 bill. Nice eh? Perhaps you Alberta-beef lovers back home are wondering why there are no meaty-options. Is all of Bali vegetarian? Well no, although vegetarianism is part a Buddhist practice and there is a significant population of Buddhists in Bali. I am simply not eating meat at the moment. You see, Sophie stayed next to a Buddhist monk in the Philippines and over lunch one day (where Sophie sat devouring a burger) he told her about vegetarianism. The arguments behind it. Or reasons I should say… who’s arguing? Anyway, he also gave her a book written by his guru and upon careful reading by both she and I, they make some really compelling points. For instance, according to this book, if we all become vegetarian, we could feed ten billion people – more than the world’s population. So no one would have to starve. What I found most intriguing was the bit about the hormones. It said that before an animal is killed it goes into “fight or flight” mode and adrenalin is released into the blood stream and into the muscles and when we are consuming that meat we are also consuming the adrenalin hormones and with that much adrenalin, we get anxiety. Interesting hey? Now I do feel the need to point out that one of the English boys put forth a counter argument that the animals, well cows anyway, are drugged beforehand to avoid that happening and without speaking to any farmers I can’t really say what’s accurate. But definitely an interesting point. And so it’s been a combination of these intriguing new ideas and the fact that meat in foreign countries can be detrimental to diarrhea-free traveling that I have not been eating meat. I don’t know that I’ve made any life changing decisions at this point or committed to anything just yet, but it works for me right now and will serve as a bit of an experiment on how it impacts me. Anyway, I digress. 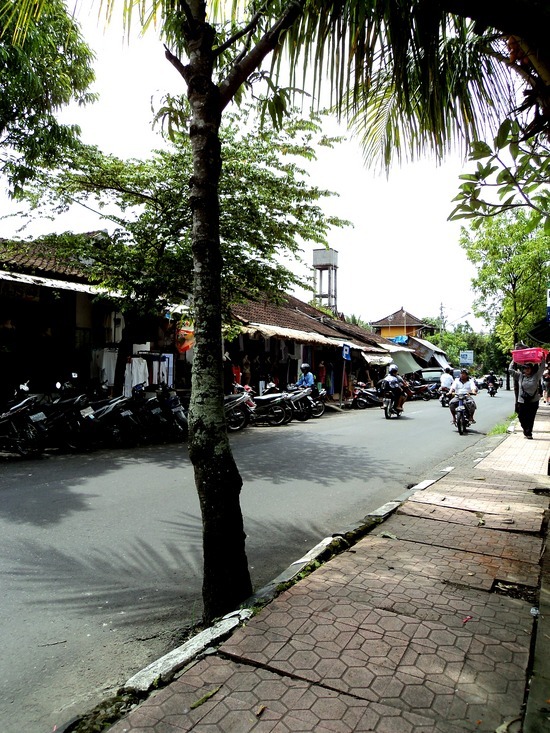 Back to Ubud. Let me tell you about an experience that is battling for the title of my all time favorite traveling moment. Something about Bali makes me crave yoga. I guess just how spiritual everyone and everything is here – seems like it fits nicely. Lucky for me Ubud had a yoga studio and although a drop-in class cost 100,000idr (a third of my daily budget), I had to go. And, bonus, it was Sophie’s first yoga experience (excluding a try at crazy intense Bikram which definitely scared her off a little). As we were walking through town to find the studio, it started raining. 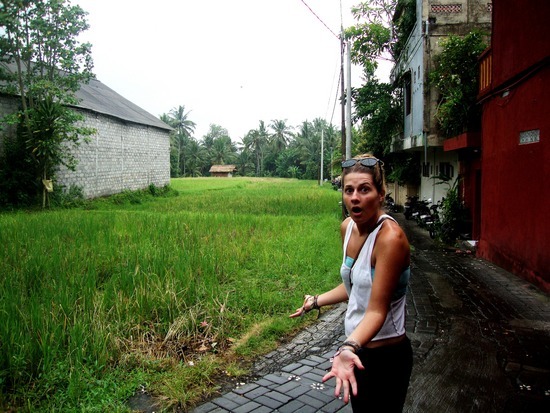 By the time we got to the studio, nestled off the road among the beautiful green rice paddies, it was a full blown lightening and thunder storm. We paid and walked up the steps to the studio. The room was packed full of hippies and locals. 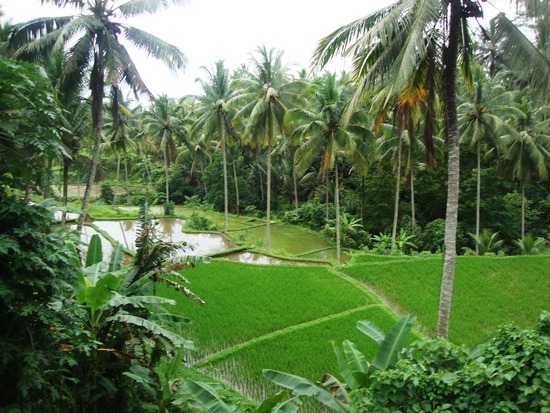 There were no walls and the upstairs studio had an unmatchable view of the rice paddies. It was breathtaking. Oozing humidity and terrorizing thunder accompanied us through the entire hour and a half of vinyasas. The instructor, an English drifter, played a beautiful soundtrack including the likes of Michael Franti and even a John Lennon cover. She desperately tried to speak over the booms. Guiding us into Warrior II, where you may have been instructed to bend toward the back wall at home, we heard “bend your right knee toward the rice paddies”. On our fourth day in Ubud we got an invite (actually we very well may have invited ourselves, I’m not quite sure) over a grape-flavored smoke at the local sheesha bar to go motorbiking into the rural areas surrounding Ubud. So the next day we strapped on our Mario brothers red helmets and hopped on behind our new English friends and took off uphill. The views. My goodness. They were… have I used the word breathtaking yet? Beautiful? Incomprehensible? Lush beyond imagination. We rode through small towns filled with lines of children waving to us as we passed, shops full of carved wood cats and even a lime green baby chick. Seriously, lime green. I don’t know what that was about. Evenings in Ubud were low key and relaxing whether we were sitting around on cushions or sprawled onto couches at the sheesha bar or having dinner and bottles of Bintang at the top floor open-air restaurant listening to a live reggae band and watching an oh-so-intoxicated 50-something expat groove along solo on the dance floor or hold hands with his lover – another 50-something man suited up in orange spandex pants, a white string bikini top and a white Lady Gaga style wig that so nicely framed his silver mustached face. Haha, yes. That really happened.